Progress has been made in recent years in reducing the disadvantages of certain routes of cannabis administration, notably the slow onset of action with oral use and harm associated with the inhalation of combustion products when smoking cannabis. Unimed Pharmaceuticals announced on February 26, 2002 its intent to develop a metered dose inhaler for cannabis (Business Wire of 26 February 2002). This announcement further indicates that inhalation may have pharmacokinetic advantages over the oral route in some applications. With regard to whole plant preparations, the use of vaporizers and sublingual use (in the studies by GW Pharmaceuticals) has been proposed to avoid concerns over harms associated with smoking. “Inhalation of carcinogenic combustion products associated with smoking is generally regarded as the major health hazard in connection with the medical use of cannabis products. Strategies to reduce respiratory and other adverse events resulting from this common practice include relinquishment of inhalation and replacement by other routes of administration, the use of plants with a high THC content allowing reduction of the amount of smoked plant material, usage of inhalation devices that improve the ratio of THC and tar, and avoidance of the Valsalva maneuver that may cause spontaneous pneumothorax. The major risk associated with oral cannabis use is accidental overdosage, especially in inexperienced users that can be avoided by appropriate dosing procedures. A combination of oral use and inhalation may be meaningful in several indications, decreasing the specific risks of both routes. Preliminary studies using rectal, sublingual and transdermal routes indicate that these alternatives to the two most common forms of ingestion may be utilized medicinally in the future, further reducing the possible risks associated with the administration of cannabis or single cannabinoids” (Grotenhermen 2001). Gieringer describes vaporization and explains why this is likely the most effective delivery method for the cannabinoids in marijuana. “The primary health hazard of medical cannabis is respiratory damage from marijuana smoke. Aside from oral ingestion and other non-smoked delivery systems not yet commercially available, strategies for reducing the harm of smoking include: (1) use of higher potency cannabis and (2) smoking devices aimed at eliminating toxins from the smoke. Studies have found that waterpipes and solid filters are ineffectual at improving the THC/tar ratio in cannabis smoke. 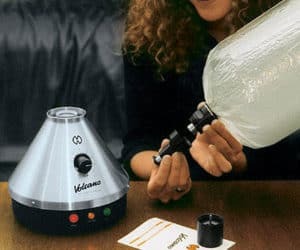 The most promising alternative appears to be “vaporization,” in which cannabis is heated to a point where cannabinoids are emitted without combustion. A feasibility study by NORML and MAPS has demonstrated that an electric vaporizer can successfully generate THC at 185°C while completely suppressing benzene, toluene, and naphthalene formation. Further studies are needed to evaluate how effectively vaporizers suppress other toxins, and how their performance varies using different samples, temperatures, and device designs” (Gieringer 2001). Albany College of Pharmacy researcher Audra Stinchcomb was awarded a $361,000 three-year grant on 21 January 2000 by the American Cancer Society to study whether cannabinoids can be absorbed effectively through the skin (UPI of 21 January 2000, AP of 21 January 2000). The research could lead to the development of a cannabinoid patch for therapeutic use. It could ease the pain, nausea and vomiting that chemotherapy patients can suffer, according to Gail Tyner-Taylor of the American Cancer Society of New York and New Jersey. The patch could give a continuous, steady dose over a period of days. “Smoking can provide a high immediate dose and make some patients high,” said Stinchcomb. “However, a marijuana patch could work better than a pill because people suffering from the effects of chemotherapy have trouble keeping pills down.” The grant for the marijuana patch is the first the American Cancer Society has awarded for marijuana research. “Some people may not approve,” said Don Distasio of the American Cancer Society, “but we are going to stick to our guns because we see this as an issue of helping patients suffering from unnecessary pain.” First results of the research were presented at the 2001 Symposium on the Cannabinoids of the International Cannabinoid Research Society (Stinchcomb et al. 2001). “The chronic effects of marijuana (…) fall into two categories: the effects of chronic smoking, and the effects of THC” (Joy et al. 1999). The smoking of other herbs and plants, particularly of tobacco, is not prohibited in the United States, even if harms are well established. One must also note that many medical cannabis users currently avoid smoking-induced harms by taking their cannabis in baked goods. For these reasons, these harms should not be used as an argument to preclude a legitimate medical use of cannabis. Gieringer D. Cannabis “vaporization”: a promising strategy for smoke harm reduction. J Cannabis Ther 2001;1(3-4):153-170. Grotenhermen F. Harm reduction associated with inhalation and oral administration of cannabis and THC. J Cannabis Ther 2001;1(3-4):133-152. Stinchcomb A, Challapalli P, Harris K, Browe J. Optimization of in vitro experimental conditions for measuring the percutaneous absorption of ?9-THC, cannabidiol, and WIN55,212-2. 2001 Symposium on the Cannabinoids. Burlington Vermont: International Cannabinoid Research Society, 2001, abstr. 161.